The Frigidaire FAD704TDP has long been a popular choice for controlling moisture in the home. It is an Energy Star® qualified and fully featured model. The FAD704TDP has now been replaced by the FAD704DUD, a similar but more compact unit. You are unlikely to find a new example for sale although there may still be a few available here and there. This page is being maintained primarily for any of you who may wish to buy a pre-used or refurbished unit and need some information about it other than that provided by the seller. The FAD704TDP has two carry handles and casters. Once programmed the humidistat switches the compressor on only when humidity rises above the level set. Turns off the compressor to allow ice on the cold coils to melt. This protects the appliance in cooler temperatures. The water condensed on the cold coils can be run off to a floor drain through a hose attached to the outlet port. These include soft touch controls, a digital humidity read-out and a 24 hour on/off timer. Removes some harmful bacteria and allergens. Click on the link to download the Owner's Manual. In consumer reviews of the FAD704TDP users have been very happy with the effectiveness of this unit in basements and other large areas. The accuracy of the humidistat has been confirmed in a significant number of reviews. There are mixed views about the noise made by the FAD704TDP but, on balance, the majority consider it rather loud. Users like the electronic controls and find them simple and intuitive to use. Some find the water bucket a mite tricky to remove. Continuous drainage is reported to work well. Most found the FAD704TDP reliable although some users experienced faults within the first twelve months following purchase. So far as noise goes there are two things to say. First, powerful models are always on the noisy side; second, the FAD704TDP produces about the same noise output as any other 70 pint unit. Reliability? I'm sorry to say that portable dehumidifiers just don't last very long. No matter which brand you buy you are probably going to have to replace it after a couple of years. The FAD704TDP is as reliable as any and better than some. My view is that the FAD704TDP has always been one the best large portables you can buy. I am quite happy to recommend it, particularly if you can get it at a good price. 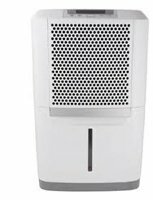 If you can't find a pre-used Frigidaire FAD704TDP Dehumidifier, or prefer the latest model, click here to take a look at the new FAD704DUD which is a little smaller and lighter.